Waste Management Services Do Domestic and Commercial Clients Need? What Kinds of Waste Management Services Do Domestic and Commercial Clients Need? Whether you own a residential property or an industrial facility, you will inevitably need the services of a reputed waste collection company in Adelaide or elsewhere. This is primarily because several activities that take place in these locations result in the generation of waste. However, waste matter does not disappear by itself. It requires proper disposal to ensure that it does not pollute or contaminate the environment. This necessitates relying on the services that waste removal companies offer. Waste removalists offer a myriad of services tailored to suit the needs of their domestic, commercial and industrial clients. By engaging a reputed company, you could eliminate the hassles of having to get rid of the waste produced at your home or office. What Does a Waste Management Company Do? In 2016, Australia’s population touched the 24 million people mark. It is worth mentioning that the production of waste is a function of population growth rate, the level of urbanisation and per capita income. Statistics reveal that Australians now produce approximately 50 million tonnes of waste annually. A rough calculation will serve to indicate that the average person produces two tonnes of waste annually. Another statistic to consider is that in the two decades from 1996 to 2015, Australia’s population increased by 28 percent. However, waste generation increased by a whopping 170 percent. Thus, the conclusion is evident. As Australia’s population increases, more people will generate more waste per person every year. Dealing with such large volumes of waste is not something that one person can manage alone. Thus, numerous waste management companies abound throughout Adelaide and other Australian cities. These entities collect rubbish and all kinds of waste from their clients. Thereafter, they dispose of the waste according to its recyclable value. Waste with recyclable value will often end up at a recycling plant. Here, the waste will undergo treatment to become fit for reuse. Waste with little to no recyclable value will invariably end up at the landfill. Good waste management companies will not just collect the waste and transport it to landfills or incinerators. Rather, they will use their resources for processing the recovered materials. This will make the materials fit for use by other business entities to make new products. What Kinds of Services Do Waste Removal Companies in Australia Typically Provide? Different kinds of facilities will produce different kinds of waste – whether solid or liquid waste. The owners of these facilities will invariably have different waste management needs. So, they will engage with waste removal companies to empty their waste bins in Adelaide and other cities. More often than not, these waste removal firms will have services that suit domestic and commercial clients alike. General Waste Pickup Services: This service involves visiting the client’s site and collecting the waste from the client’s doorstep. In many cases, rubbish removalists will pay a visit at a time proposed by the client. Yard Waste Removal Services: Not many homeowners like having to compost their yard waste. They will prefer their waste removal company to collect all the tree limbs, grass clippings, leaves etc. and dispose of them in an eco-friendly manner. Bulk Waste Pickup Services: Occasionally, homeowners might want to dispose of bulky items such as old mattresses, furniture etc. Similarly, commercial establishments might want to dispose of a lot of old and unwanted equipment and junk. Bulk waste pickup and removal services are useful in dealing with such situations. Organic Waste Removal Services: Many residences produce a lot of organic waste daily. Dumping this waste along with other waste could render it useless. Instead, composting this waste could produce soil conditioner that is rich in nutrients. Waste Recycling Services: Not all waste removal companies are equal. The established players in the domain usually run various waste recycling programs. Their facilities will feature machinery and equipment that can recycle paper, plastic, metal and other similar waste materials. Are You Looking for the Best Waste and Recycling Rates in Adelaide? In Adelaide, waste management is a serious business. This is why we take great pains to ensure that our waste removal services offer an attractive blend of reliability, cost-effectiveness, eco-friendliness and versatility. 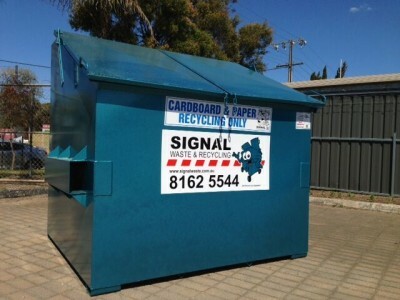 At Signal Waste & Recycling, we offer a myriad of waste management services. Waste collection and recycling is our forte. But, we can also deal with liquid waste, business waste and commercial waste. Our services are quite popular among private, industrial and commercial clients. Even various governmental agencies utilise our services to dispose of their waste effectively. With us, you can expect to receive the best and most efficient services time and time again. Check out our waste removal services here.